There’s something about roast potatoes fresh out of the oven that makes most of us feel a bit nostalgic. Add the scent of rosemary and garlic, and you’ll find more than a few little visitors lingering around the dinner table. Cut the potatoes in halves; peel and crush the garlic cloves. Throw the potatoes and garlic into a roasting pan. Add the rosemary leaves and salt, then drizzle with olive oil. Give the potatoes a stir to ensure that all pieces are covered in oil and the spices have dispersed evenly. Bake for one hour or until potatoes are crispy and golden. You’ll love this fool-proof recipe for a delicious roast chicken almost as much as your kids will love taking it to school on their sandwiches the next day. Set aside about 90 minutes and have some snacks ready for the kids — when they smell that chicken roasting, their bellies are sure to rumble! Preheat the oven to 180 degrees C and place a large, deep roasting pan inside. Give the chicken a rinse with water and pat dry with a clean tea towel. Grab a knife and make about four or five incisions across the thighs. Mix the olive oil with salt and pepper to taste. Rub some of the olive oil mixture into the gap between the skin and the meat of the chicken breast. Next, rub the mixture over the rest of the chicken — yep, even the interior cavity. Combine the onion and rosemary, then stuff inside the chicken. Once the bird is well and truly seasoned, tuck the wings in and cross its legs, then tie them together with kitchen twine. Grab the roasting tray from the oven and pop the chicken inside, with the breast side facing down. Drizzle a little more oil over the chicken if necessary. Roast in the oven for about 50 minutes, or until cooked through and the juices run clear. Let rest for about five to 10 minutes. 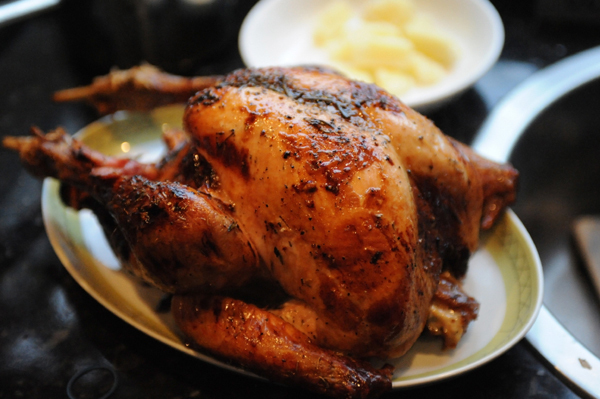 Slice the roast chicken and serve with gravy and veggies. After such a hearty dinner, keep dessert light with deliciously caramelised fruit and ice-cream. Split the vanilla bean and scrape out the seeds. Throw them into a bowl with the sugar, then stir. Preheat a grill to medium-low heat. Cut all of the fruit in half and remove the seeds, then place the halves on a baking tray with the skin side down. Sprinkle the vanilla and sugar mixture over the fruit flesh. Place the fruit halves under the grill and cook for about four minutes or until the fruit begins to soften and brown. Pop the grilled fruit into individual bowls and serve with a few dollops of vanilla ice-cream.